NEW YORK, NY--(Marketwired - Oct 2, 2015) - In this age of assumed social media engagement and a growing trend toward the gamification of business, one of the biggest challenges for conference and event organizers is no longer simply keeping their audience entertained but to have them fully participating. The reality is an observer looking around the room will witness fidgeting, yawning listeners, and more often than not, disinterested, dazed stares directed at a smartphone, laptop or tablet. Instead of active and engaged players, the organizer is left with distracted participants that they herd from one session to another hoping for the occasional tweet. But we all know a tweet doesn't translate into an active and participatory audience. That's where Livecube.co breaks through! The web-based app filters out the noise and helps attendees focus on the conversations and connections at hand while delivering the event essentials and engagement through fun game mechanics. 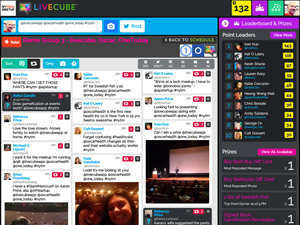 Introduced in 2014 at NY Tech Meetup, Livecube is positioned as the social engagement app that "does it all." Justin Schier, Livecube's cofounder and CEO, said to rushPRnews. "the whole idea is to use the latest engagement technology to motivate the audience with points, badges, and real-world rewards. Turning the process of attending an event into an entirely participatory conversation among all present." Supporting Schier's claims, Jared Fox, Manager, Organizational Strategy Division of Instructional and Information Technology (DIIT) for New York City schools, said, "Working with Livecube allowed our summit's attendees to engage on social media in a real, purposeful way. " Fox adds, "I think this was a testament to the power of this app. Without it, the conversations would have remained between the summit paper program and isolated silos. Instead, the exchanges were so animated that for the first time ever, one of our event trended on Twitter." So how does it work? With six simple steps. And finally, the attendees with the most points win a prizes based on participation, completion of challenges and popularity of their posts (getting reposted earns more points). And it stores candid photos taken by the participants, which may be reused for cross marketing. Most extraordinary is what the participants are left with. Livecube's post event reporting acts as a story summary of their experience at the event. It not only helps them recollect specific connections and experiences but it facilitate ongoing contact forging relationship. The event may be over but the conversation is forever! To schedule an interview with Justin Schier, Livecube's CEO, contact Anne Howard at AH PR here. Livecube: World's Best Event Engagement App.